It was great meeting Bonifacio Brass, owner of Locanda Cipriani, last Thursday and interviewing him for the blog. I’d eaten a light lunch there two years previously when I visited beautiful Torcello for the first time and when I was talking to William Goodacre of Tastes of Italy last December about Torcello and the Locanda, he offered to arrange a meeting with its owner, Bonifacio Brass, grandson of Giuseppe Cipriani. Do look at my last post if you haven’t read it already for details of that meeting and a background to the lovely Locanda – click here. At the end of the meeting, Bonifacio kindly offered me lunch, to which the obvious answer was, Yes please! Even without the interview, it’s certain I would have returned to the Locanda on this last trip as I’d loved it so much the time before. It’s also wonderful to escape the crowds of Venice for a day and ahead across the Lagoon in a vaporetto to this peaceful island where it is so easy to relax and find a quiet time. 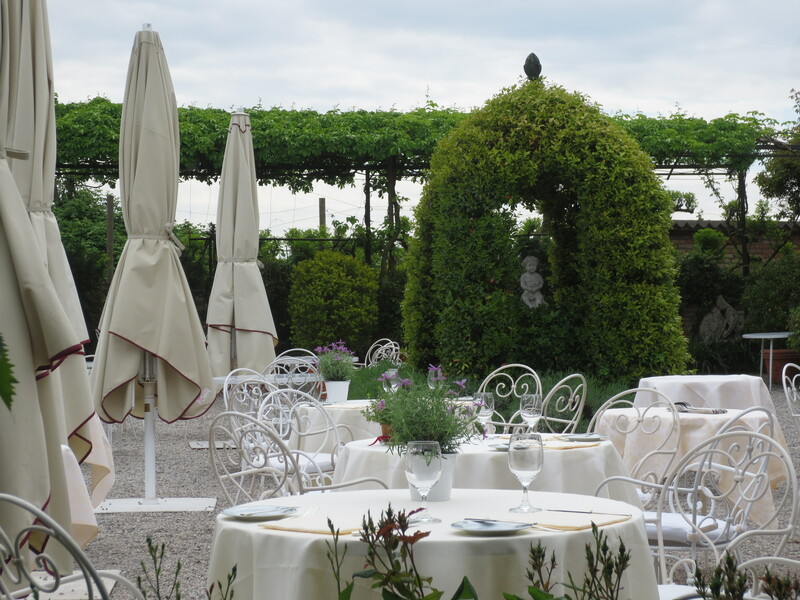 The Locanda is also a place of tranquillity. There’s a wonderful homeliness to it combined with a sure touch of professionalism. You step inside and you could almost be entering someone’s home. The dining area in the garden is a more sophisticated affair. It’s a stunning location for a Venetian meal. The weather was slightly chilly last Thursday and rain threatened so I opted to eat in the covered terrace rather than right outside, but I still had the experience of being in the garden, which was great. My waiter was of Venetian heritage but grew up in Australia. He immediately made me feel welcome and was wonderfully informative about what I might eat and drink and also how dishes were prepared. This kind of excellence is all one hopes for in a restaurant of this quality. I never felt smothered by too much attention but he was always on hand if I wanted him. I was on holiday. I was in Venice. 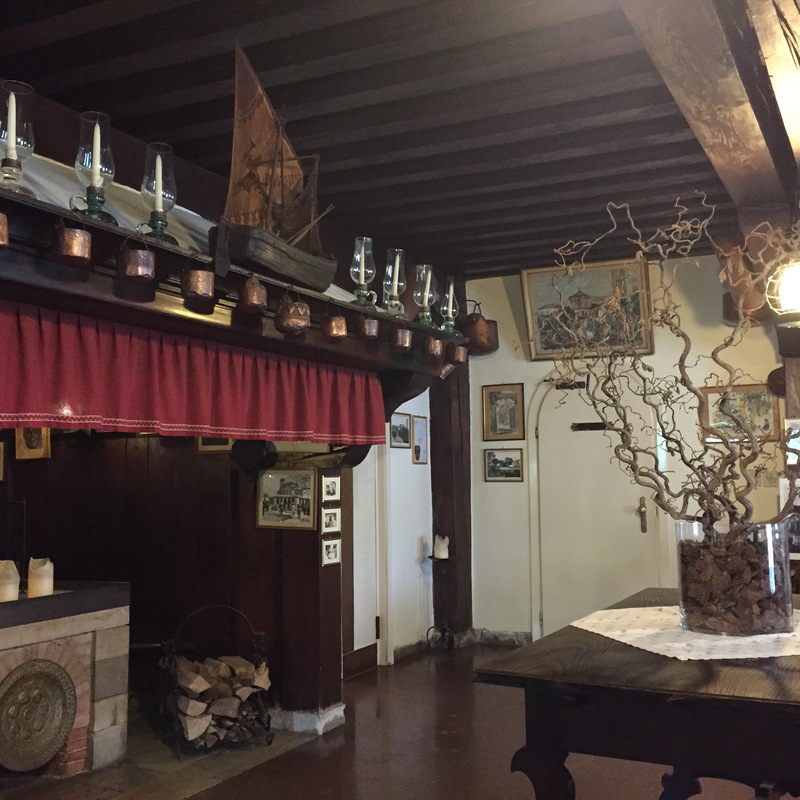 More particularly I was on beautiful Torcello and in a Cipriani restaurant. 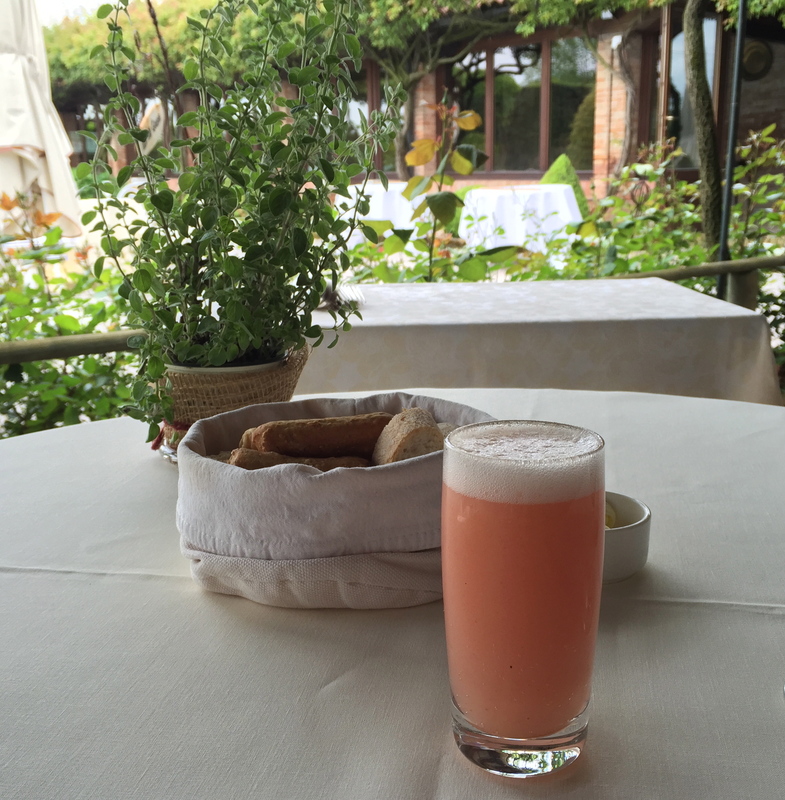 What could be better than beginning with a Bellini? A wonderful cocktail of fresh peach juice and Prosecco invented by Giuseppe Cipriani at Harry’s Bar. Quite amazingly for someone who has been to Venice so many times and who drinks Prosecco each evening when there (Prosecco is a local Veneto drink), this was my first ever Bellini. Why had I waited so long! It was delicious. It came with a basket of fresh bread and breadsticks. As I slowly sipped my drink and enjoyed my surroundings, the restaurant started to fill up. Some guests opted to sit in the terrace like me, while others braved the grey skies outside in the garden. Later, slight rain fell and waiters quickly put up large umbrellas and everyone seemed happy to stay where they were. 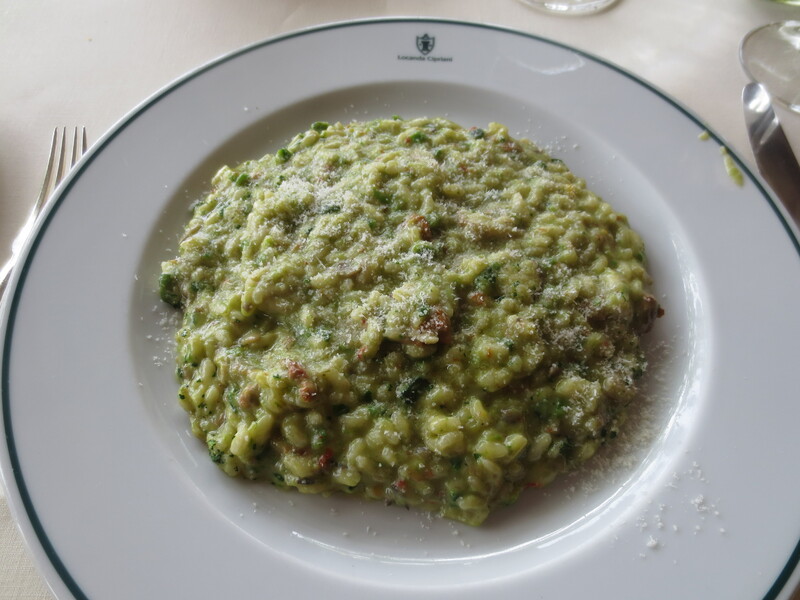 I looked at the menu but had already pretty much decided to have the Risotto Torcello, which William had told me about: a vegetable risotto made with seasonal ingredients and a Cipriani classic. It seemed ideal for lunchtime. My waiter gently suggested that as it takes a bit of time to prepare a risotto (because it’s definitely not something you prepare in advance), I might like a starter. Oh how lovely to be encouraged to be even more indulgent! And what a choice. 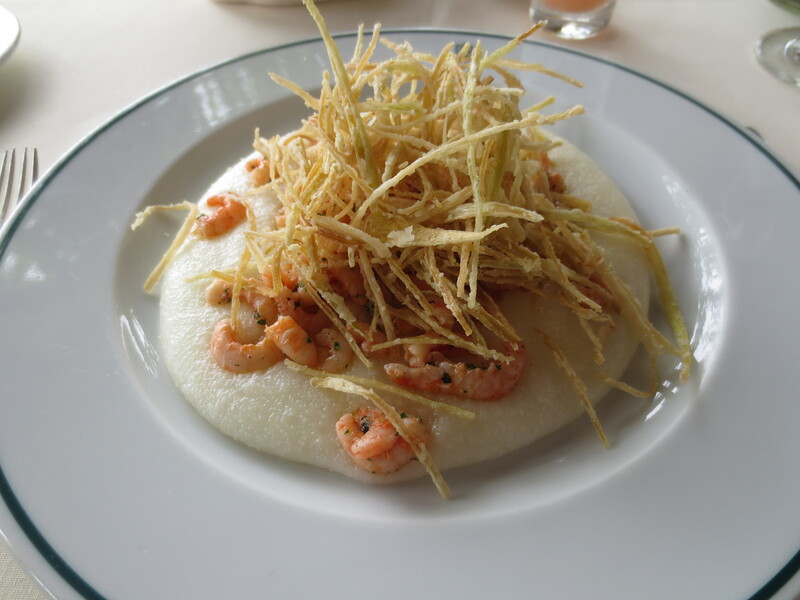 I decided to have some white polenta (polenta is another Venetian speciality and is often served with meat or fish) with Lagoon shrimps and shredded leek. What a fabulous choice that turned out to be! Polenta is a tricky thing and can be quite unpleasant if badly prepared. This, of course, was perfect – a creamy consistency and perfectly judged seasoning. The flavour of the tender little shrimps was intense and sweet. I’ve rarely tasted shrimps so good. And the crunchy little topping of shredded fried leek added flavour and texture. It was a glorious dish. My waiter had explained the risotto to me; that it had some ingredients which were always included like mushrooms and aubergine, but others changed with the seasons. As it was springtime it would now include the new asparagus that had just come into season, baby artichokes and fresh peas. Each vegetable is cooked separately and added to the rice at different stages. The waiter spooned it onto a plate from a dish and a glorious aroma wafted across to me. Before I’d tasted it, I knew it was going to be good. I’m a great fan of risottos. I cook them a lot and that only makes me more fussy about them; a fussiness that means I rarely order them out and only in restaurants I trust. Well, of course, I didn’t really have to worry in Locanda Cipriani but still, to be as impressed as I was was quite something. This was superb; without doubt one of the best risottos I’ve ever eaten. Such glorious flavours, each vegetable cooked perfectly, each flavour distinct but marrying into a delightful whole. The consistency had that glorious creaminess one looks for in a good risotto; the rice cooked al dente so that it retained a bite but was definitely cooked through. There’s a dichotomy in eating alone: on the one hand it is so lovely to share a good experience with someone; but on the other hand there’s a certain pleasure in being able to totally give yourself to eating something wonderful with no distraction. Haven’t we all had times when we’ve been so busy talking over a meal that what passes into our mouths is barely noticed? I can tell you I took my time over my meal – the wonderful starter, the sublime risotto. I enjoyed every mouthful – and the sharing comes now with you! Further temptation came with the dessert menu. I am so easily tempted in such excellent surroundings! 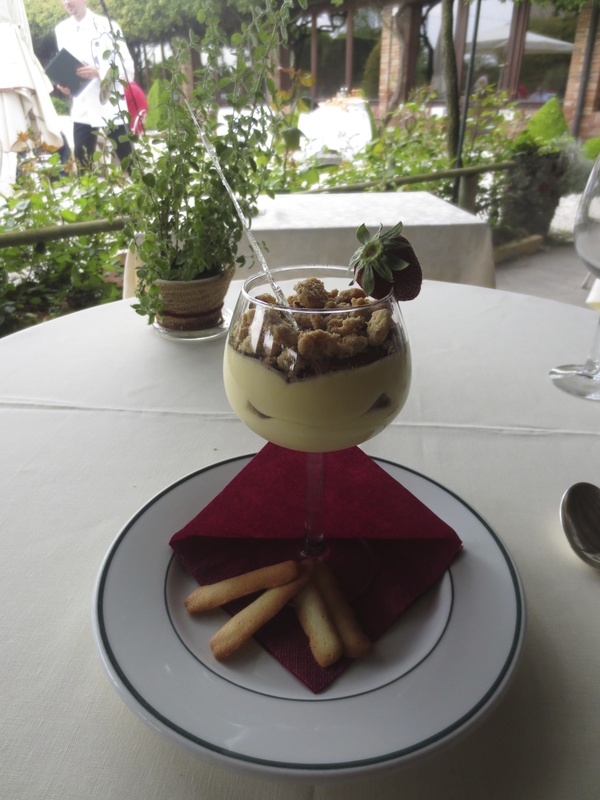 I decided on the Locanda’s take on Tiramisu – which turned out to be very indulgent indeed! It was gorgeous: rich with a great balance of flavours. It was also quite large. 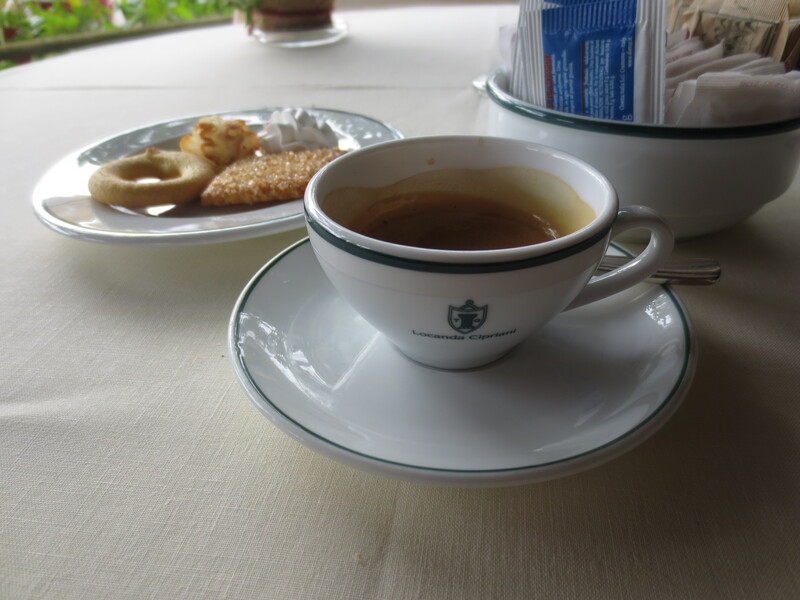 When coffee came with lovely little homemade biscuits there was no way I could indulge further. It was a fabulous meal. When in Venice this is an experience not to be missed! I was lucky to be treated to this meal but the prices are very reasonable and I know I shall go back. 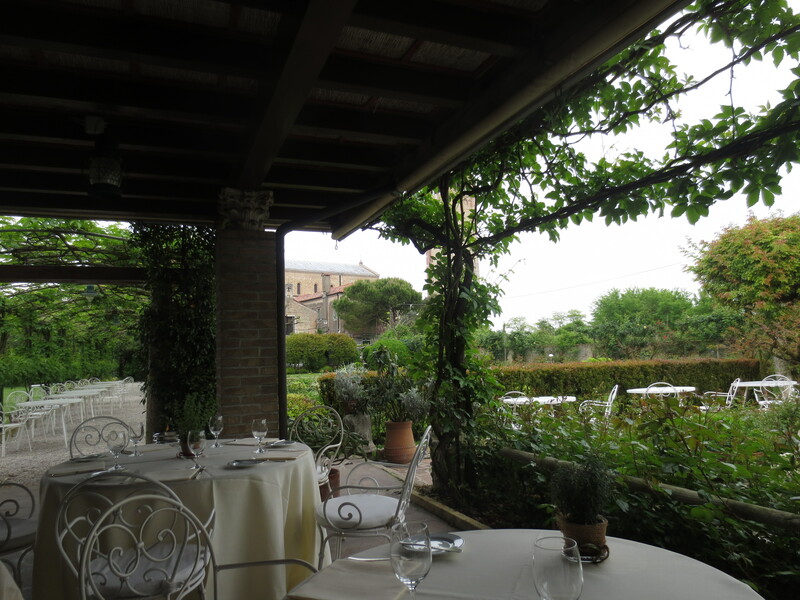 A visit to beautiful Torcello with all its charm and tranquillity; a lunch in the gardens of the wonderful Locanda Cipriani – now that really is a perfect day. You can now download this article and more on Venice on to your smartphone or tablet with the GPSmyCity app – Click here for link.